This monster is based on the mythological duke of hell, Beelzebub, also known as the Lord of the Flies. This monster is the LIGHT version of Steelswarm Roach, after having joined the side of good, as seen in Sacred Serpent's Wake. The fact that this is an Evilswarm Monster is ironic, since the other Evilswarms are evil, while this one is not. Additionally, this monster has a tellarknight/Zefra version: Stellarknight Zefraxciton. This monster's name references the Exciton, the electrically neutral state of an electron found in insulators and superconductors. These particles are formed by the absorption of photons by superconductive substances, and can transmit energy without also transporting an electrical charge. Fittingly, this monster represents a neutral character formed by a DARK monster absorbing photon energy to transform. This monster's appearance resembles the Tokusatsu heroes from the Kamen Rider Series. Interestingly, this monster's storyline happens to resemble the first Kamen Rider's origin story, as a being created by an evil faction who later switched sides to fight for justice. This card is the first and only non-DARK lswarm monster. Being a non corrupted lswarm monster, this card's attack and defense do not end in 50. This trait in only shared with Evilswarm Kerykeion. This monster's cloak features the same black sparkles seen on Constellar Xyz Monsters. This is the only lswarm monster to be Limited in TCG. Detaching 1 Xyz Material from this card is a cost to activate this effect. When the effect resolves, even if the number of cards in your hand/field has become more than the opponent's, the "destroy all other cards on the field." effect is still applied. ("your opponent takes no further damage this turn" is also applied. ): When resolving the effect of "Evilswarm Exciton Knight", if the number of cards in your hand/field has become more than the opponent’s, how does the effect resolve? 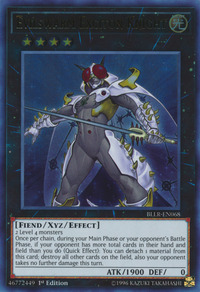 The effect of "Evilswarm Exciton Knight" cannot be activated more than once in the same chain. Also, if not on the same chain, after resolving the effect of "Evilswarm Exciton Knight", you can activate its effect again that turn. (However, you can only activate it a second time if your opponent's cards in the hand and on the field still outnumber yours. ): Can the effect of "Evilswarm Exciton Knight" be activated more than once per turn? If the effect of "Evilswarm Exciton Knight" is negated by "Skill Drain" or the effect of "Light and Darkness Dragon", the "your opponent takes no further damage this turn" effect is not applied. : If the effect "Evilswarm Exciton Knight" is negated by "Skill Drain" or the effect of "Light and Darkness Dragon", is the effect that reduces all damage the opponent takes to 0 still applied?